Jen Newton shares outstanding summer reading academy results with the Board of Education. A prime example of Core Belief #2, we believe learning growth matters most, was on display Monday evening as Washington Elementary Title I Teacher and CCSD Summer Reading Academy Coordinator Jen Newton shared with our Board of Education the outstanding growth our summer school students displayed. Jen reported a whopping 70% of summer school students met or exceeded their goal of maintaining or growing their end of year composite reading performance based on DIBELS test results. Additionally, 11 of our students who did not attain this goal still showed good gains in fluency and accuracy. Lots of thank you’s go to the staff at McKinley Elementary this week for focusing their effort on Core Belief #2. Toward this effort, their Title Team, Literacy Coach, and Special Education department did a wonderful job scheduling reading intervention sessions both during and after school. As part of this effort, they created a sustainability plan by expanding Lindamood-Bell testing training throughout the building. Christy Johnson and Mark Lyons are taking on the important work of preparing for and tutoring students, and Kari Holcomb and Jessica Stevens established the student selection process for the program. I have no doubt this effort, and the actions of their instructors, will result in wonderful student learning growth. I also want to share an instructional shout out about Brittney Wilcox who clearly exhibited our 4th core belief. Brittney is a 5th-6th grade teacher at Cañon Exploratory School who has been doing a great work differentiating instruction in Math, producing outstanding learning targets, and having students complete learning target reflection sheets after lessons are taught. Every bit as important, Brittney has been working hard on her communication with parents, and from what I hear this is much appreciated. This is hard work, but Brittney’s actions show she clearly emphasizes what is good for kids over the needs and comfort of adults, in this case herself. This week’s embodiment of Core Belief # 1 is Michelle Nethercot, a second grade teacher at Washington Elementary. Principal Brian Zamarripa reported this about Michelle, “I’ve had several interactions with parents of students you once had or currently serve, one being during a recent 504 meeting, and I want to commend you for the work you do to meet the needs of your students.” Brian added, “last week the guardian of a student you had last year praised you for the relationship you developed with her granddaughter while she was in your classroom, and for your consistent communication regarding her child's classroom performance.” “The level of success this student experienced was greatly due to who she had as a teacher.” In a communication I receive from Mr. Zamarripa, he went on about how effectively Michelle has already been establishing positive and trusting relationships with her students, even though we are not even one month into the school year. Thank you Michelle, for the way you meet the social-emotional needs of ALL your children! A Harrison student speaks to the entire student body during the student council election speech assembly. I want to thank Mitch Ary and Dani Donnell for all the hard work they put into last week's Harrison Student Council Election Assembly. I stumbled upon this when I was in the building and observed students from all grade levels making speeches in front of their classmates. From what I hear, this was the first time many can remember Harrison holding a student council election including candidate speeches. The addresses were eloquent and their passion for making the school a better place was clearly evident. What a great way to help students develop our key traits of civility and agency! On Tuesday and Wednesday of this week board directors Larry Oddo, Lloyd Harwood, Mary Kay Evans, and Shad Johnson will interview eight candidates interested in filling Kristyn Econome’s open board seat. I have no doubt this will be a difficult decision for them, and I remind everyone who has shown interest there will be three board openings (including his one which will soon be filled) next fall during our regular biennial election cycle. At its regularly scheduled meeting last Monday the Cañon City Board of Education also approved a resolution in support of Colorado Amendment 73. I’ll share the full text of this resolution in this week’s Other Voices section. However, key to this action was the board’s effort to clearly delineate how additional revenues will be invested the education of children should the measure pass. -33% of new dollars will be invested to increase compensation and benefits for all employees in order to continue attracting and retaining the highest quality people available to work with our children. -25% of new dollars will be invested to increase the number of highly qualified staff in areas such as classroom instruction (to decrease student to teacher ratios), special education, instructional support, counseling, technology support, instructional coaching, health services, and maintenance and upkeep of facilities. -25% of new dollars will be allocated to general and capital reserve funds to create strong balances to allow the district to address future personnel needs, facility improvement projects, and provide grant matches to more greatly leverage local dollars. -6% of new dollars will be invested in safety and security upgrades to include replacing outdated surveillance equipment, purchasing technology-based security platforms, placing security guards in every school, and expanding our team of School Resource Officers. -4% of new dollars will be invested in continuous technology equipment and broadband service upgrades to support instructional technology. -4% of new dollars will be invested to continually upgrade instructional materials. 2% of new dollars will be applied to eliminating all fees currently required of students and parents for participating in regular education programs and extracurricular activities, as well as to eliminate fees currently charged to local organizations and agencies for the use of school facilities, allowing them to pass savings on to their program participants. -1% of new dollars will be invested in sustaining our K-8 free breakfast program and expanding it to the high school level. The CCMS staff discusses the benefits of grade level and subject area room configurations. We held our third design meetings for both our CCMS and Washington building projects this week. Key tasks included determining how the buildings will support our instructional models. The entire CCMS staff participated in making a decision classrooms will be grouped on a grade level basis. This will support their middle-school instructional philosophy, as well as the conduct of cross-curricular Professional Learning Community work. A key focus on the Washington front is deciding how best to group grade level classrooms, and whether to pursue space for a potential preschool -daycare program. We also had representatives from the Cañon City Recreation District, Solvista, and Valley-Wide health services at our meetings. We're asking Recreation representatives to advise us on how we might more readily support their building use needs, and Valley-Wide/Solvista representatives are in the room because of our desire to include a school-based health center at CCMS. Last week I worked with Assistant Superintendent of Schools Adam Hartman on revising the Measures of Student Learning portion of our evaluation calculator, attended a regular board meeting and work session, held Superintendent Advisory Council and Building Design Team meetings, observed the high school P-TECH parent informational kickoff event, observed delayed start professional development activities, began work updating district and school level Unified Improvement Plans, attended a quarterly CCEOE meeting, and attended a regional superintendent's meeting. I also dealt with a few unexpected tasks of major importance. 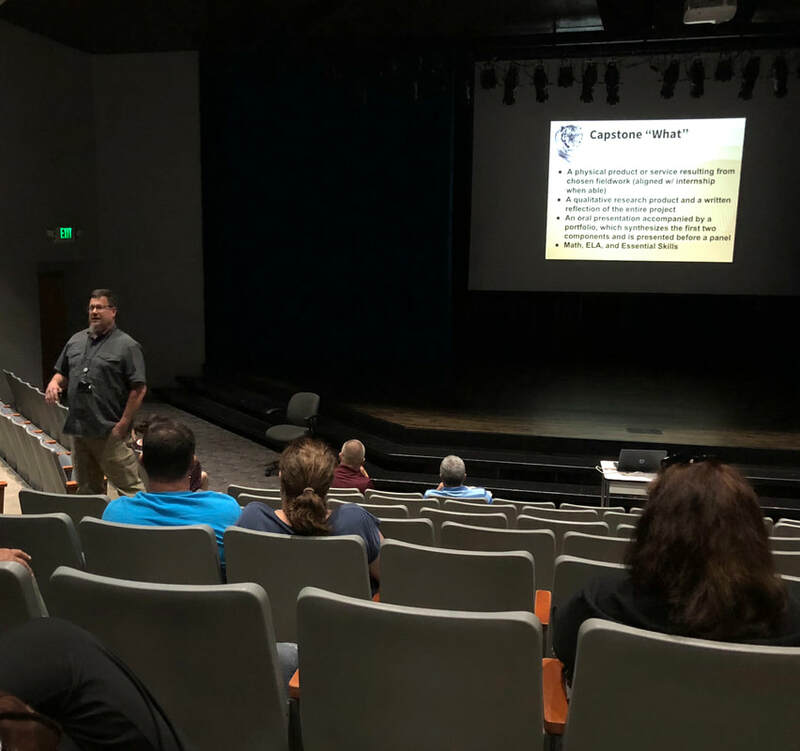 CCHS Principal Bill Summers shared important information to Class of 2021 parents about how their child can participate in the new P-TECH partnership. My schedule for Monday includes a bunch of parent meetings and an afternoon/evening trip to Springs for the CASB Fall Regional. On Tuesday I have mental health collaboration, BSERT, SAC, and CCMS design meetings. On Wednesday I have 1451 (human services collaboration), staff recruitment, and Instructional PLC planning meetings. On Thursday I teach a full day Leadership Cañon session and will end the day in our first IBS session on Recruiting and Retaining High-Quality staff. So far Friday looks light, with a high school business department meeting and a Fremont County Dream Big event phone conference. As stated above, at its regularly scheduled meeting last Monday the Cañon City Board of Education approved a resolution in support of Colorado Amendment 73. What is Amendment 73? Amendment 73 would amend the Colorado Constitution to increase funding for PK-12 public education and provide tax relief for nonresidential property owners while stabilizing the local share of school funding. -It creates a graduated income tax (stay tuned to learn more about this). -It increases corporate income tax by 1.37% for C-Corps only (C-Corps are basically Limited Liability Corporations). -Lowers the residential assessment rate to 7.0% from 7.2% and freezes it there. -Lowers nonresidential assessment rate to 24% from 20% and freezes it there.
. . . all to increase funding for public schools. • 33% of new dollars will be invested to increase compensation and benefits for all employees in order to continue attracting and retaining the highest quality people available to work with our children. • 25% of new dollars will be invested to increase the number of highly qualified staff in areas such as classroom instruction (to decrease student to teacher ratios), special education, instructional support, counseling, technology support, instructional coaching, health services, and maintenance and upkeep of facilities. • 25% of new dollars will be allocated to general and capital reserve funds to create strong balances to allow the district to address future personnel needs, facility improvement projects, and provide grant matches to more greatly leverage local dollars. • 6% of new dollars will be invested in safety and security upgrades to include replacing outdated surveillance equipment, purchasing technology-based security platforms, placing security guards in every school, and expanding our team of School Resource Officers. • 4% of new dollars will be invested in continuous technology equipment and broadband service upgrades to support instructional technology. • 4% of new dollars will be invested to continually upgrade instructional materials. • 2% of new dollars will be applied to eliminating all fees currently required of students and parents for participating in regular education programs and extracurricular activities, as well as to eliminate fees currently charged to local organizations and agencies for the use of school facilities, allowing them to pass savings on to their program participants. • 1% of new dollars will be invested in sustaining our K-8 free breakfast program and expanding it to the high school level. The Board authorizes the mobilization of District resources to distribute a factual summary to Cañon City School District residents regarding Amendment 73, in accordance with the Fair Campaign Practices Act, C.R.S. 1-45-117. ADOPTED AND APPROVED THIS 10th day of September 2018.